Any of you guys here in TX want to piggy back on this? Looks like a great route and good turnout. I plan on going. I'm booking for Friday and Saturday night. Saturday Oct 16th is the Main Run. We'll be doing all the roads people want to run when they do the Hill Country, 23, 16, 335, 336, 337(the twisted sisters). We'll be running twisties all day Saturday ending back at the motel around 4pm for beers around the pool. After relaxing from the days events a group dinner at the Acapulco(walking distance from the motel). That would be a ton of fun. Its to early to say if I can go or not.. VR4 will be SOLD this weekend so I would have to get the alltrac ready for a long road trip. It runs but shes far from ready for something like this. I've been trying to find someone I could pay to do all my maintenance/tbelt/H20 pump stuff done. I tried EMS down here but can't get a reply. By the time this comes around I may end up having done it myself. If it's done, I'll have no qualms about making the run. I know that Keri was looking at a late fall run also so either way I would prepare for something. 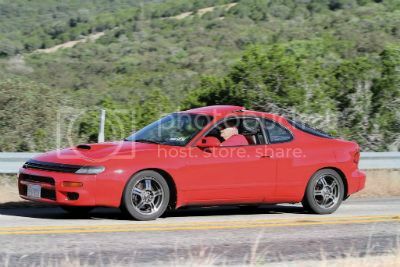 I think in TX we're up to around 6 185s and 4 st165s so even an All-Trac/celica meet would be good. MixMaster wrote: I've been trying to find someone I could pay to do all my maintenance/tbelt/H20 pump stuff done. I tried EMS down here but can't get a reply. By the time this comes around I may end up having done it myself. If it's done, I'll have no qualms about making the run. You gonna try to do the t belt and stuff with the engine still in the car? Its a pain. I found that if you remove drive shaft, unbolt exhaust, remove cross members and a few other things you can tilt the motor down on the left side and get to the tensioner much easier. I have some directions from a few sites all printed out. Figured I would take my time and just knock it out. Crank pulley sounds really brutal but it sounds a lot like what you're saying. Like I'm going to be raising and lowering the motor with a jack and going through the pass side wheel well. LOL I know what you mean. Bringer up here and you can pay me. This new job keeps me busy so it may take a few weeks. Unless something comes up, I'm in for this one. It looks like a lot of fun. I've hit of few of the roads over there since I've been here. Pretty nice. Paul, if you'd want to bring the car to San Antonio, I can hook you up with the guy that did my timing belt and water pump. I supplied the parts. He did it for $220. The guy's got a two bay garage behind his house. He and his two sons work there. They did a great job. I've put about 1000 miles on the car since they did it and no problems. I highly recommend him. Until I get a house with a garage, he'll be doing my work. If we could put a Celica/All-Trac meeting together in the fall that would be cool I'd be up for that as well. Before I moved down here, I'd been going to TN in the fall and running the Tail of the Dragon with CMS-GT4 and some of the other local guys from Celicatech. I'd like to find something like that here. Mike, did that include the 2 Hoses from hell and all the seals? I'll text you what all I need to get done. I also want to put in 3rd gen cams at the same time but $220 sounds like a deal and worth the cruise down. I don't think we're going to be able to make that MR2 hill country run ... with Super 2 the budget is pretty tight & we can't afford to stay at a motel for a couple of days right now + gas, food etc. Would ya'll want to get together around the 1st part of November? Well before Thanksgiving, but with cooler weather it should be much more bearable without being too cold. I don't think any of us have A/C .... there's no way I have time to fool with Vadar's right now & R2 will prolly be gutted by that time. I think I would prefer a smaller Alltrac meet anyway - 12 or so cars is more than enough to keep up with. That gives me more time to procrastinate on getting the car ready. Besides, october/november in the hill country is awesome! I'd be in as well. I'm still planning on making the October run with the MR2 guys but I'd definitely be up for an All Trac meet. That's one thing about my location, it's not much of a drive to most locations in the hill country. Sounds good everyone - when it gets closer to time we'll firm up date/location & have a map of the route we want to take. I think its time to start planning this.. What do you guys have planned?